The x-ray radiographic testing method is often used for detecting defects as a non-destructive testing method (NDT). In many cases, NDT is used for aircraft components, welds, etc. Hence, the backgrounds are always more complex than a piece of steel. 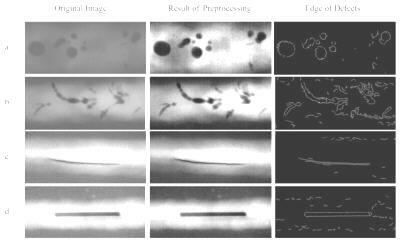 It is difficult to detect defects using classical image processing methods. In this paper, we apply wavelet algorithms with a digital X-ray image to extract defects to aid automated radiography inspection. In our algorithms, after obtaining the x-ray image, we firstly use wavelet thresholding to reduce image noise to improve the quality of the radiographic image. Then we extract defects from the radiographic image. In the process of extracting edge features, according to the wavelet multi-scale character obtained from edge information at different scales, we integrate the coefficients of wavelet transforms on a series of scales to look for the best scale where the edges are well discriminated from noise to extract edge features. With the help of wavelet algorithm, an objective and fast computer based evaluation of defect indications is possible. Nondestructive testing (NDT)is widely used in many fields,particularly for critical applications such as welds of pressure vessels,ships,aircraft etc. 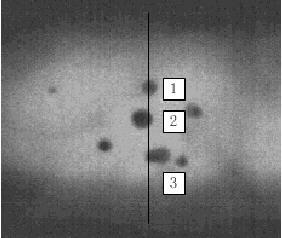 One of the most important techniques used in NDT is radiography that is based on the transmission of X-rays or Gamma rays through an object to produce an image on radiographic film. The interpretation of a radiograph is being done manually by experienced interpreters in the field. It is time and manpower consuming work. In addition, human interpretation of weld quality based on film radiography is very subjective, inconsistent and sometime biased. So, in the paper, the computer-aided interpretation of images of uneven background parts is studied. 1. The defects are all quite small. 2. The defects 'positions are random. 3. The contrast is low. 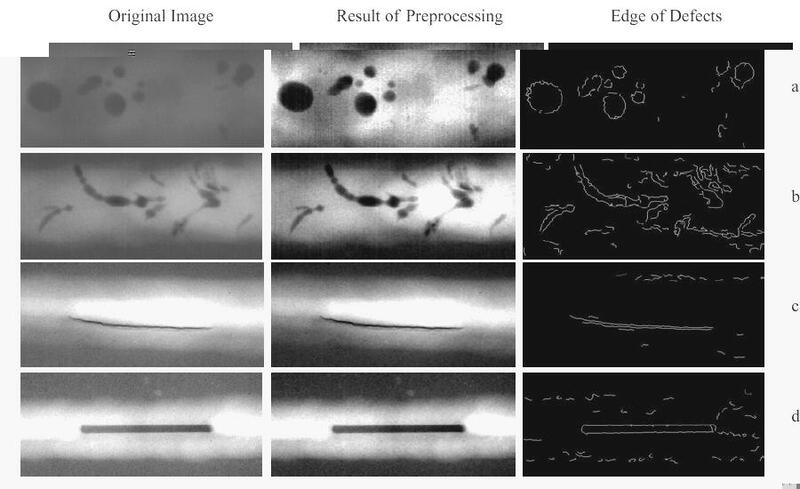 So,it is difficult to detect defects using classical image processing methods.In recent years wavelets obtained an increasing importance in signal and image processing. The wavelet transform is closely related to the Fourier transform. Contrary to the Fourier transform the wavelet transform operates on wavelets as its basis functions, which are finite in the frequency and spatial domain. This avoids the well know artifacts from the Fourier transform. While the Fourier transform decomposes the original signal in its frequency components,the Wavelet transform perform a multi-scaling analysis of the signal [1 ][2 ]. In this paper, we apply a kind of wavelet algorithm with digital X-ray images to extract defects to aid automated radiography inspection. The radiographs are digitized using HP6100 Film ScanJet. The resolution of the scanner is as high as 1200dpi (pixels per inch). The distance between two pixels is about 20 µm. And the images are stored as 8 bits, which means there will be at most 256 gray levels in the images. The gray level is only in a small range,so although we use 8 bits (256 levels)to record the image most of the levels are wasted. There are depressions at the defects. But it also contains signifficant noise. The sizes of noises are small, but the change rates are often large. Because of those characteristics of radiographic images, in order to find the defects effectively, some preadjustment should be processed. This image does not have a brightness range that cov- ers the full range of the digitizer.The result is an image whose histogram covers only a portion of the available values for storage.Contrast stretching may improve the visibility of the features and the perceived contrast in lo- cal structures by spreading the histogram out to the full available range. However it is diffcult to add some gray levels into the image. The number of missing brightness values are same as the image, but now they are spread uniformly throughout the range. After the Contrast stretching, it is the noise removing. In the paper, the adaptive wavelet thresholding technique is used to remove the noise. The theoretical formalization of wavelet denoising via thresholding wavelet coefficients was presented by Donoho [3 ]. Wavelet denoising attempts to remove the noise present in the signal while preserving the signal characteristics, regardless of its frequency content. It involves three steps: 1. Calculate the wavelet transform. 2. Threshold the wavelet coefficients and discard (setting to zero) the coeffcients with relatively small or insignifficant magnitudes. By discarding small coefficients one actually discard wavelet basis functions which have coefficients below a certain threshold. 3. Compute the inverse wavelet transform to get the denoised estimate. The threshold determination is an important question when denoising. ByesShrink is a subband adaptive threshold that is computed for each detail subband. In BayesShrink [4 ],we determine the threshold for each subband assuming a Generalized Gaussian Distribution (GGD). BayesShrink is more visually appealing and adapts to discontinuities in images. After image preprocessing, the image has higher contrast and less noise. Because it is difficult to detect edges using classical edge detectors, here we detect edges of X-ray image using wavelet algorithm. According to wavelet multiscale character,after obtain edge information at different scales we integrate the coefficients of wavelet transforms on a series of scales to look for the best scale where the edges are well discriminated from noises to extract edge features. 3.1 Construction of Wavelets Several researchers have introduced the concept of multiscale edge detection to detect the contours of small structures as well as the boundaries of large objects [5 ][6 ]. The wavelet transform is closely related to multiscale edge detection [7 ]. Firstly, we choose Gaussian as the smoothing function, i.e. Hence, edge points can be located from the two components, W1s f (x,y )and W2s f (x,y )of the wavelet transform. A Gaussian function through a Gaussian filter is still a Gaussian function, but with a dilated variance. So, we can calculate the wavelet transform of f (x,y )on a series of scales using cascade algorithm as follows. In an image, all edges are not created equally. Some are more signifficant, and some are blurred and insignifficant. The edges of more signifficance are usually more important and more likely to be kept intact by wavelet transform. The insignifficant edges are sometimes introduced by noise and preferably removed wavelet transform. In mathematics, the sharpness of an edge can be described with Lipschitz exponent. The wavelet theory proves that the Lipschitz exponents can be computed from the evolution across scales of the wavelet transform modulus maxima [7 ]. The resolution of an image is directly related to the proper scale for edge detection. High resolution and small scale will result in noisy and discontinuous edges; low resolution and large scale will result in undetected edges. The scale is not adjustable with classical edge detectors, but with wavelet transform,we can construct our own edge detectors with proper scales. Wavelet filters of large scales are more effective for removing noise, but at the same time increase the uncertainty of location of edges. Wavelet filters of small scales preserve the exact location of edges, but cannot distinguish between noise and real edges. We can use the coefficients of the wavelet transform across scales to measure the local Lipschitz regularity. That is, when the scale increases, the coefficients of the wavelet transform are likely to increase where the Lipschitz regularity is positive, but they are likely to decrease where the Lipschitz regularity is negative. The locations with lower Lipschitz regularity are more likely to be details and noise. For X-ray image, the noise is Dirac distributions as show in Figure 3. A single Dirac pulse has negative Lipschitz regularity that means when the scale increase, wavelet coefficients decrease in magnitude. So,we can use a large scale wavelet at positions where the wavelet transform decreases rapidly across scales to remove the effect of noise, while using a smaller-scale wavelet at positions where the wavelet transform decreases slowly across scale to preserve the precise position of the edges. Using the cascade algorithm to observe the change of wavelet transform coefficient between each adjacent scale,we can distinguish different type edges. The edges acquired from this way are not one-pixel-width edges and it is necessary to be thinned. Thinning is one of the most important pre-processing steps for feature extraction in many pattern recognition systems. In edge extraction,the thinning process also plays an important role.Zhang-Suen algorithm [8 ] is based on 4-neighbor connectivity,and the method is very simple and efficient. So, this thinning method is adopted. The proposed approach is tested on X-ray image as shown in Figure 4. The obtained results show most of the edges of defects can be found,and the algorithm is appropriate to not only linear defect such as crack and penetration but also volumetric defect such as porosity. And the sizes of the defects are quite similar to the real size. Figure 5 shows all the edges of defects larger than 0.3 mm and with contrast larger than 15 could be detected by this algorithm.Most of the missed defects are smaller than 10 pixels in both width and height.The distance between two adjacent pixels is about 20 µm ,sosizesof the missed defects are always less than 200×200 µm. And all of the missed defects have low contrast to the background. In this paper,we apply wavelet algorithm with digital X- ray images to extract edges of defects to aid radiography inspection. The obtained results show the effectiveness of using wavelet algorithm to detect edges in X-ray images. It has therefore succeeded to deliver directly contours of welding defects present in radiography, contrary to classic edge detection operators. Indeed,the proposed based on wavelet edge detection technique has provided satisfying results on noised images.With the help of wavelet algorithms,an objective and fast computer based evaluation of defect indications is possible. I.Daubechies,Ten Lectures on Wavelets siam, 1992. Stephane Mallat, "A theory for multiresolution signal decomposition:the wavelet representation," IEEE Transaction on Pattern Analysis and Machine Intelligence Vol.11, pp.674-693, July 1989. D.L.Donoho, "De-noising by soft thresholding," IEEE Trans. Inform. Theory 41(3), pp.613-627, 1995. S.Grace Chang,Bin Yu and Martin Vetterli," Adaptive Wavelet Thresholding for Image Denoising and Compression,"IEEE Transactions on Image Processing Vol.9, No.9, pp.1532-1546, Sep.2000. A.Witkin, "Scale Space Filtering, " Proc.Int.Joint Conf. Artificial Intell 1983. D.Marr and E.Hildreth, "Theory of edge detection, " Proc. Royal Soc London, Vol.207, pp.187- 217, 1980. Stephane Mallat and Sifen Zhong,"Characterization of Signals from Multiscale Edges," IEEE Transactions on Pattern Analysis and Machine Intelligence Vol.14, No.7, pp.710-732,1992. T.Y.Zhang and C.Y.Suen, "A fast parallel al- gorithm for thinning digital patterns," Commun. ACM, Vol 27, pp.236-239, 1984.